In spite of boycotts by CEOs of top global companies by the U.S. and a number of other Western nations, the St. Petersburg International Economic Forum, held on May 22-24 in Russia’s second city, saw contracts signed between U.S. firms and Russian market players. 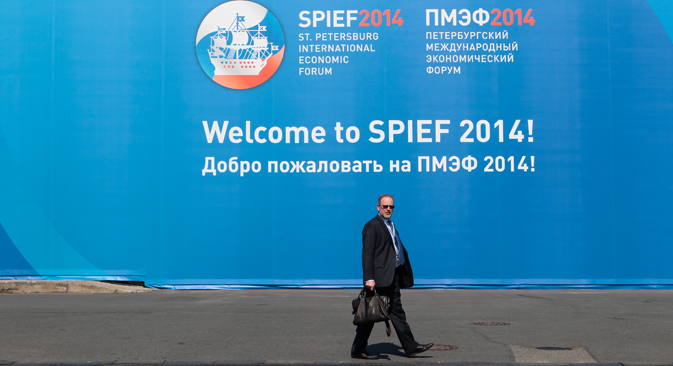 The St. Petersburg International Economic Forum, which this year was held on May 22-24, is traditionally considered to be the largest international economic event in Russia, a platform where the CEOs of international companies can meet directly with Russian government representatives, including President Vladimir Putin. However, according to the New York Times, this year the U.S. Presidential Administration advised CEOs against attending the forum, and American companies were represented by second-rank executives. Similar decisions were made in Europe. Yet the move does not appear to have had serious effects on business, as U.S. companies still signed contracts with Russian market players, including agreements with the head of oil company Rosneft Igor Sechin, who was personally included on the U.S. list of sanctions. “Corporations that were advised against attending the forum sent second-rank executives, so there were actually a lot of representatives from our foreign partners,” said Ivan Fedotov, vice rector of the Russian Presidential Academy of the National Economy and Public Administration (RANEPA). In particular, Visa Inc. was represented at the forum by Executive Director for Central and Eastern Europe, the Middle East, and Africa Kamran Siddiqi; PepsiCo by the Chief Executive Officer of PepsiCo Europe Enderson Guimaraes; and ExxonMobil by the President of ExxonMobil Exploration Company and Vice President at Exxon Mobil Stephen Greenle. In that respect, according to Investcafe analyst Timur Nigmatulin, one can hardly say that the event turned out to be any less significant than in previous years. “SPIEF remains a key platform where public and private, Russian and foreign partners establish working relationships,” said Nigmatulin. “Western attempts to boycott the forum and put pressure on domestic business to refrain from participating failed to have the desired effect,” said Anton Soroko, an analyst from the investment holding FINAM. According to Soroko, this year’s forum actually broke all the records in terms of participation numbers: A total of 6,500 people registered for the forum this year, out of which only 1,500 were media representatives. According to Mikaelyan, if restrictions for foreign companies had been enacted as retaliatory measures in response to the events surrounding the Ukrainian crisis, then such restrictions will now be loosened. The expert notes that the inefficiency of the sanctions and measures to put pressure on business is especially apparent in light of the number of agreements signed with Rosneft, considering the fact that the head of the company, Igor Sechin, is personally included on the U.S. list of sanctions. Sechin’s agreement with Mubadala Petroleum from the UAE involves jointly developing oil fields in Asia and southeast Africa. Moreover, the company also signed an agreement on the collaborative exploration and development of oil fields, including offshore oil fields, with companies from Azerbaijan, Venezuela, India, and Cuba. Another important outcome was the fact that, after negotiations with First Deputy Prime Minister Igor Shuvalov and Minister of Finance Anton Siluanov, Visa and MasterCard decided to continue operations in Russia. Prior to the event, the Visa and MasterCard systems had blocked cards issued by banks that were included on the U.S. sanctions list, which was a point of concern for the Russian authorities. “Accusations turned into a constructive dialogue, which set the tone for an economically reasonable solution to the conflict,” Soroko said. The privatization of state assets was another important issue, especially for telecommunications company Rostelekom, which could start the privatization process in the third quarter of 2014. Foreign companies might take part in the process. “As the organizers had anticipated, the main event turned out to be the president’s speech, and the forum served as a platform to declare Russia’s position on gas, Ukraine, and other important issues. Our foreign partners understood the signal,” said Fedotov. As a result, according to Nigmatulin, a significant reduction in capital outflow should be expected for the second quarter of 2014; it is unlikely that outflow will top $10-$15 billion. “Considering the current state of affairs - the conflict in Ukraine, the confrontation between Russia and the West, the president’s visit to China, and the outcomes of this visit – the forum turned out to be a lot more significant than it had been in previous years, in spite of the incomplete list of participants,” said UFS IC chief analyst Alexei Kozlov.